Following an old Traditional Recipe and Artisan Process, Effervé is made with this crystalline Natural Spring Water, pumped straight from our Spring, directly into the bottle. 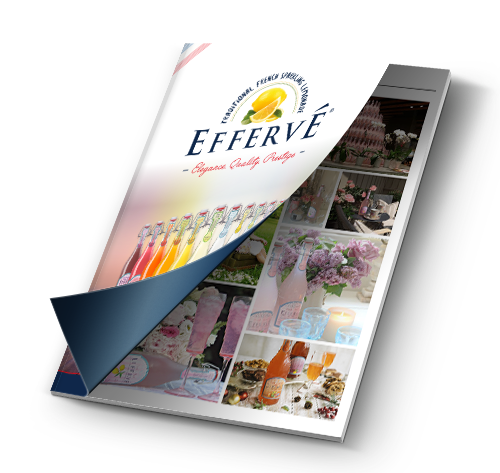 Sicilian lemons, Brazilian oranges, Italian tangerines, Normandy apples, Anjou pears… are some of the inspiration points of the Effervé product range which now counts 11 different flavors. Thanks to the prime quality of our Spring Water and All Natural Flavors, Effervé is clean and crisp, flavorful yet healthy – a deliciously refreshing Sparkling Lemonade for the entire family. Gluten-free and Non-GMO, Effervé combines Authenticity and Quality with Elegance and Prestige.